With songs that explored the darker sides of LA’s culture in the early ’80s, Exene Cervenka and her band X’s unique brand of folky punk rock has made them a permanent fixture in LA’s musical history. Exene Cervenka. Photo © 1991 Marcie Ronen. In the late ’70s and early ’80s, the punk band X rescued Los Angeles from the clutches of the bloated, “mellow,” stadium-rock that had become its signature sound. Fronted by a married couple, Exene Cervenka and John Doe, who shared lead vocals and songwriting credits, X became known for raw harmonies, hillbilly/punk music and poetic lyrics on romantic love and domestic strife. When the band parted amicably in 1988, they left behind a score of critically acclaimed albums, a marriage, and a generation of younger bands influenced by their sound. But if anyone worried for the fate of X’s lone female survivor, Exene Cervenka, she ably proved her solo talents with two albums, Old Wives’ Tales and Running Sacred. She’s remarried to actor Viggo Mortensen and they have a young son. Most recently, X has reformed and they are working on a new album. In town to headline a benefit concert to “Ban the Dam” at the Beacon, Exene finished the soundcheck and hurried over to the Natural History Museum to buy a gift for her son. Lynn Geller I read somewhere that the writer, Michael Blake, dedicated Dances with Wolves to you? Exene Cervenka Yes, he did! LG That’s an honor. Why? EC Because he stayed at my house a lot when he was writing it. He didn’t have anywhere to live and we’re friends. LG I read about his struggle and thought it was great he got rewarded for all the hard work. So few people do. EC And he’s using his power quite well. He’s into literacy and saving wild mustangs in Nevada. LG The other day I came across Adulterers Anonymous , the book you wrote with Lydia Lunch. Are you still writing poetry? EC Of course, I’m still writing poetry. What is poetry? It’s just words; I’m a writer. I don’t think there’s any difference in writing songs, or poetry, or letters. I’ve written letters that were turned into songs—two, as a matter of act. LG I noticed that you and Lydia would add lines to each other’s poems, as if you were passing them back and forth. EC We lived right near each other, so we sat around and did things together, and then we had some that were already finished. LG You’re here to do the benefit and then you’ll be flying right back, isn’t that exhausting? EC Not really. You’re in an airplane, then a hotel, you do a soundcheck, you go to a museum, get something to eat. It’s not that bad. I’d be more exhausted right now if I was home with my son, Henry. LG How old is he? LG You’re living in LA now? EC I’m living in Venice, which is part of LA, but near the ocean. LA is like New York, there are all different factions and unfair labor practices going on, refugees from our wars in Central America and all these people out of work. It’s depressing. LG It’s painful. We should get back soon. Are you the headlining act? EC Yeah, we’re the loudest band. (to clerk) You know those blue dinosaurs with the fins down there, could I have one of those? LG That place is great for kids’ presents. Do you want to have more kids? EC Right now my work is really important and I don’t want to give up any more time than I already have. LG I wouldn’t have a kid without the right mate for child-rearing. It seems selfish to start without that. EC It’s really hard to have a relationship when it’s a man and a woman trying to decide how to raise a child. Sometimes, I think it’s easier for a woman to have a child and a support system. In what’s considered pre-history, women raised children as a unit and did a lot of the cultural stuff for the tribe. To me, that makes sense. People aren’t meant to be isolated in two-person households, a male-dominated, male and female household. People weren’t designed to live that way. I consider things tribal in my life. LG Is that the way you live? EC I don’t live that way enough, but I live that way somewhat. LG Personally, when I’m in love, I want a monogamous relationship. It’s too distracting and insane to bring other people into it. Then, you’re either lying, guilty, or jealous. And I hate jealousy. LG In the bigger sense, if you love someone, they’re not replaceable. But it’s hard to be philosophical in the here and now. Uh-oh, look how many journalists are here. Where should we go? EC But it’s not a material thing, it’s an emotional thing. LG I love that song on your second solo album, “Slave Labor,” about your heart being your boss and not wanting to “quit your job.” It made me want to make a T-shirt for the women I know, with the phrase, “It’s not my station,” on the front. That’s something waiters say to explain why they don’t or can’t take your order. But I wonder why we feel compelled to give in and give it up to men? LG Boy, since we last talked, I’ve gone about 20 blocks and you’ve been to Cairo, then back in the studio, and now you’re going to England. What are you going to do in London? EC We’re just going to go there to work with a producer and see if he’s the right person for us. And just to get out of LA for a while, so we can be four people who live and work in the same place. Instead of driving to rehearsal and driving home, it’s kind of an intense X band thing. LG When we talked last time, I didn’t realize that you were working on a new X album. How did that come about? EC We always had it in the back of our minds, that we would do it again, but we didn’t know for sure when. We finally found the time to do it. It’s been about a year that we’ve been back together doing some shows and writing songs. LG You have a record deal? EC Yes, with Big Life Records, an English company. That’s another reason we’re going to England. LG I know you took Henry to Cairo, are you bringing him to England? EC No, not this time. It would defeat the purpose of the trip. LG Does everyone in your band have kids? EC No, just me and John. LG It does make things harder professionally. I guess that’s something you have in common, being parents and musicians. He has a daughter? EC Yeah, born the same day as Henry. And a baby. LG I read that book you recommended, The Beauty Myth by Naomi Wolf. Did that influence you? LG You and your husband moved to Idaho for awhile right? EC We have land in Idaho. But I can’t be happy just watching the vegetables grow. I can do that later, when I’m 60. LG Both you and your husband have careers in fields that require collaboration, which usually involves living in or near an urban center. It’s hard having that creative impulse. EC It’s hard wanting to live in the middle of the woods without electricity and also wanting to fly to England and make a record. You don’t know what you’re supposed to be doing. Maybe that simpler existence is a world of incredible insight where you’re plugged into a whole different kind of energy, maybe it’s calm because it is so simple. So you think you want to be running through the woods naked all the time, but you also want to change the world with your work, to be an artist. Letourneur discusses her film La vie au ranch , a film that observes, in fine detail, the flowering and dissolution of a group of young women. 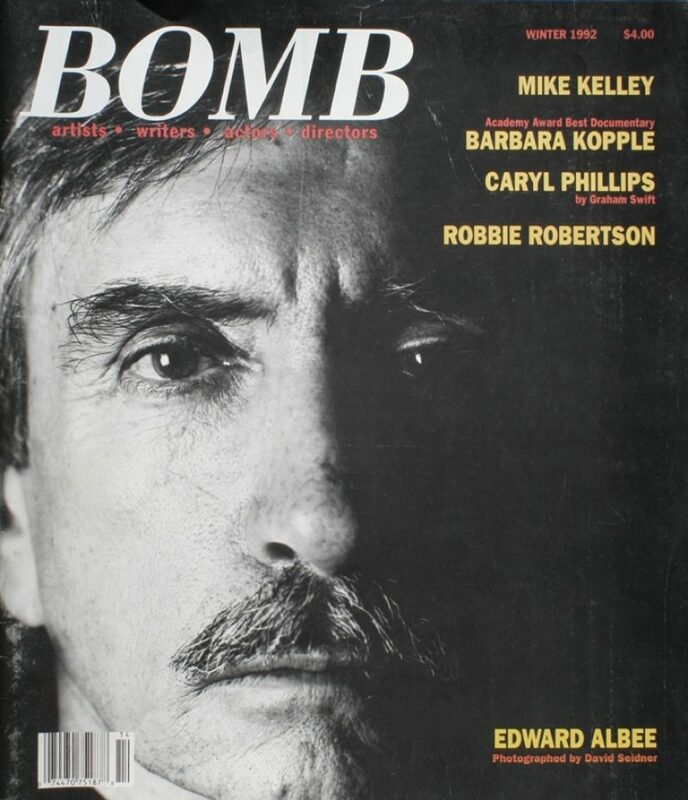 Featuring interviews with Edward Albee, Caryl Phillips by Graham Swift, Barbara Kopple, Mike Kelley, Colm Tóibín, Valerie Jaudon, Robbie Robertson, Brigitte Rouan, Nicole Burdette, Clutter, Todd Ayoung, Exene Cervenka, and Carolyn See.